The Audio 478 Folding USB Headset from Plantronics provides a great way to communicate when you're on-the-go. The headset is Skype certified, and even allows you to start or end a Skype call directly from the headset. The headset is equipped with a noise-cancelling microphone and Digital Signal Processing for crystal clear calls. Additional benefits include a lightweight design and comfortable earpads. 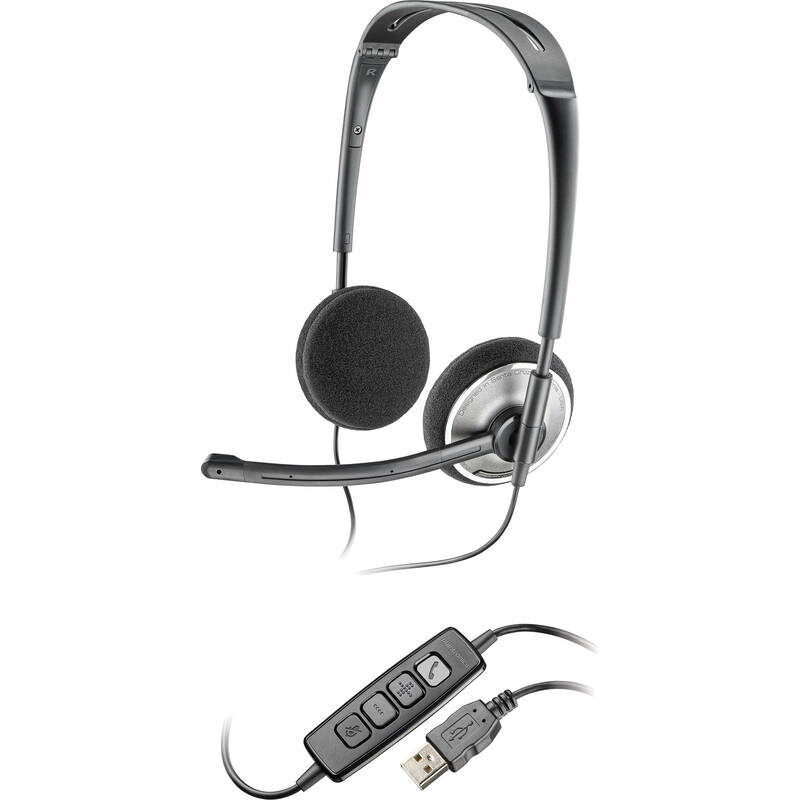 Box Dimensions (LxWxH) 8.4 x 4.5 x 2.6"
Audio 478 Folding USB Headset is rated 4.2 out of 5 by 5. Rated 3 out of 5 by Livefish from Works Well Enough. Purchased for Skype conference calls to isolate and cancel ambient noise. They seem to work well enough, sound quality similar to Logitech models. All plastic construction and the folding capability will need to be tested with time and use. The inline volume and mute controls are larger than needed but easy and useful. Completely plug-n-play on a MacBook Pro. Rated 5 out of 5 by Kevin from Best Value! My company provided me with a set of Audio 478s for use at work. I enjoyed the quality so much I bought a set so I could take meetings from my home office. When I saw B&H's price I could believe it. Best headset I've ever used for work. Definitely recommend. Rated 4 out of 5 by R. K. Tsune from Works perfectly Voice and gaming chat work with no issues. My only complaint is that there seems to be a part loose inside one of the ear pieces. It doesn't effect performance however. Rated 5 out of 5 by Charles from Definetly would buy again or recommend to a friend We use this for our dragon naturally speaking software and it works great! Rated 4 out of 5 by ExploreEverywhere from Looks good, arrived super fast Everything's great so far (1 week in). Have good hopes, we'll see.